Comment on Preliminary Finkel Report. The Chief scientist, Alan Finkel’s preliminary report (PR) shows demonstrable bias and a failure to take account of fundamental environmental impacts by assuming that Intermittent Renewable Energy sources such as wind and solar would result in a sufficiently low carbon outcome. Further, the PR has failed to align the electricity generating options to the required greenhouse targets as recommended by the UNFCC in 2050. The Preliminary Report limits its brief to current 2030 targets yet robust high quality baseload generating systems such as nuclear power plants can readily last for 80 years and take Australia through to the end of this century. We need to be planning now for periods well past 2050 and not short term targets up to 2030. No nation has limited their greenhouse gas reductions using intermittent renewables at a rate that ensures a 90% reduction of their electricity emissions by 2050 let alone their primary energy emissions. Nations quoted in the report such as Germany have stalled on emissions reductions and are new embracing lignite coal plants while their electrical greenhouse intensity remain around 490 g CO2/kwh. Ireland has been quoted extensively for its ability to integrate renewables into its electricity generation. The larger picture of Irish emissions shows that between 2014 and 2015 their emissions increased by4% due to increases in coal and peat use for electricity generation even though renewables increased by 20.6%. Paralleling an increase in renewables there was a 1.9% increase in the emissions intensity of power generation in 2015 (476 g CO2/kWh) compared with 2014 (468 g CO2/kWh). Similar issues exist in other nations such as Denmark and Spain. The PR assumes that intermittent renewables with battery storage will be embraced by Australia. This may be so but only if subsidies continue to underpin consumer choices. The science shows that batteries are a poor short lived solution for energy storage. They are emissions intensive, very heavy and polluting in their manufacture. For transport needs we need to remain aware of developments in China such as the High Temperature Gas cooled Reactor and its stated capability to synthesise transport fuel. One litre of synthesised ammonia or dimethyl ether contains over a hundred times as much stored energy as its battery equivalent. 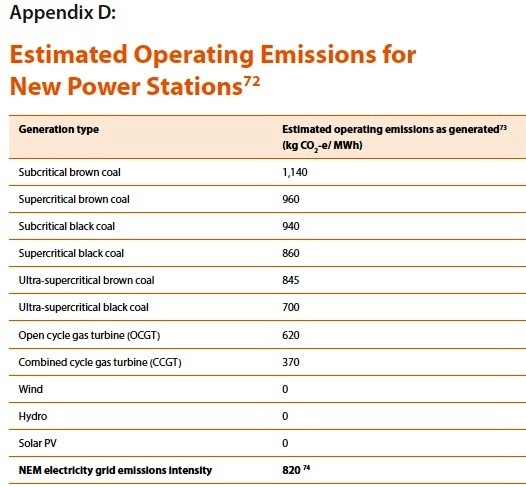 The estimated operating emissions for new power stations listed in Appendix D present a misleading impression that wind, hydro and solar are zero emissions technologies. Nuclear energy is not even included in the list. To ensure that decisions are based on good science the entire Life Cycle Emissions should be used. Further, “warehousing” Australian emissions in manufacturing nations such as China needs to be addressed in the analysis. If the full emissions life cycle analysis does not form the basis of a market which is being reformed to account for emissions intensity then erroneous outcomes and market failures will occur. The Preliminary Report outlines a clear bias towards intermittent renewables and their expensive integration into a more fragile grid with support from battery storage. This has not been proven to be successful to date and is speculation at best. Nuclear energy has demonstrated in nations such as France, Switzerland, Sweden and the United States that it has an established track record as the fastest technology available to provide economy wide emissions reductions.